Pocket able to display both A4 (210 x 297mm) & DL (210 x 99mm) sizes! Literature display attaches to top of post without any tools necessary! Blocking off areas or setting up queue is easy with 1.8m long retractable belt! This stanchion post includes a brochure holder that attaches to the top of the stand without any tools necessary! The pocket is able to hold A4 (210 x 297mm) or DL (210 x 99mm) sizes of literature that are in portrait orientation. The pocket is dual-sided as well, which allows people on each side of the crowd control stanchions to access pamphlets. The clear acrylic also allows full view of catalogues to be seen so that patrons can easily see what they are taking. 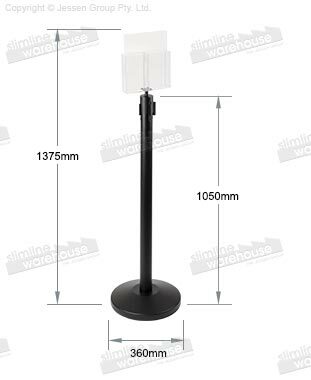 The retractable belt barrier, stanchion post is made from steel with a black matte finish for both a stylish look as well as an extremely durable stand. The base is weighted as well to help stabilise the unit. A rubber sole on the bottom helps to prevent scratches to floors during use. The belt itself extends out up to 1.8m to easily reach a wall clip or other stanchions. The (3) connectors are still usable with the pocket attached to the stand, and the belt clip is tamper-proof to remain attached to other posts!